Take advantage of life's sweet returns. Leverage your income. Work part-time or full-time and achieve your goals by leveraging your time and effort with the strength of your entire sales organization. Create a financial return of five, ten or even 100 times that of a traditional job. Be recognized. Stand proudly as an example of success - your achievements will be appreciated and celebrated. Receive Bonuses. Earn extra money and enjoy leisurely travel to beautiful destinations around the world. Enjoy Life. In the end, life is most rewarding when you have the opportunity to live it. Opportunity, recognition, time, travel, satisfaction and security - enjoy living with Life Rewards. Generate 50 personal LP in each calendar month. This qualifies the Distributor to receive 2% commission (1st generation) and 15% commission (2nd generation). They will also qualify for participation in the Power Pool. Generate 100 personal LP in each calendar month, be signed up on AutoShip or Back-up AutoShip for at least 100 LP and enroll four Associates or above (two must be frontline), each with a minimum monthly purchase of 100 LP. The Leader is now qualified to receive commissions on three generations; 2% (1st generation), 25% (2nd generation) and 5% (3rd generation). They will also qualify for participation in the Power Pool. Generate 100 personal LP in each calendar month, be signed up on AutoShip or Back-up AutoShip for at least 100 LP and enroll six Associates or above (three must be frontline), each with a minimum monthly purchase of 100 LP. The Diamond must have 3,000 GLP in his or her first 3 levels (without compression). In addition to the commissions earned by a Leader, a Diamond is now qualified to receive the 4th generation infinity bonus; 6% (4th generation to infinity unless interrupted by another Diamond or higher). They will also qualify for participation in the Power Pool. Generate 100 personal LP in each calendar month, be signed up on AutoShip or Back-up AutoShip for at least 100 LP, personally enroll eight Associates or above (four must be frontline), each with a minimum monthly purchase of 100 LP and have 10,000 GLP in his or her first 3 levels (without compression). A Pres. Diamond must also have two separate Legs containing at least one distributor with a paid as rank of Diamond or higher. In addition to commissions earned as a Diamond, the Pres. Diamond now receives 12% on the 4th generation infinity bonus and 6% Infinity Pass-Through Bonuses, as well as two additional levels of Infinity Bonuses (3% through 2 generations of distributors with a rank of Presidential Diamond or higher.) They will also qualify for participation in the Power Pool. Generate 100 personal LP in each calendar month, be signed up on AutoShip or Back-up AutoShip for at least 100 LP, personally enroll ten Associates or above (five must be frontline), each with a minimum purchase of 100 LP and have 20,000 GLP in his or her first 3 levels (without compression). An Int. Diamond must also have two separate legs containing at least one distributor with a paid rank of Pres. Diamond or higher. In addition to receiving all the benefits of a Pres. Diamond, he or she will qualify for two additional levels of Infinity Bonuses (2% through 2 generations of distributors with a rank of Int. Diamond or higher). They will also qualify for participation in the Power and Premier Pools. Generate 100 personal LP in each calendar month, be signed up on AutoShip or Back-up AutoShip for at least 100 LP, personally enroll twelve Associates or above (six must be frontline), each with a minimum purchase of 100 LP and have 20,000 GLP in his or her first 3 levels (without compression). A Gold Int. Diamond must also have three separate Legs containing at least one distributor with a paid rank of Int. Diamond or higher, plus at least 250,000 LP in Organizational Volume. In addition to receiving all the benefits of an Int. Diamond, he or she will qualify for two additional levels of Infinity Bonuses (2% through 2 generations of distributors with a rank of Gold Int. Diamond or higher). They will also qualify for participation in the Power and Premier Pools. Generate 100 personal LP in each calendar month, be signed up on AutoShip or Back-up AutoShip for at least 100 LP, personally enroll twelve Associates or above (six must be frontline), each with a minimum purchase of 100 LP and have 20,000 GLP in his or her first 3 levels (without compression). A Platinum Int. Diamond must also have three separate Legs containing at least one distributor with a paid rank of Gold Int. Diamond or higher, plus at least one million LP in Organizational Volume. In addition to receiving all the benefits of a Gold International Diamond, he or she begins to qualify for participation in the Platinum Pool (1% of the company LP). Be an active 4Life Distributor. Enroll three or more new distributors at 100 personal Life Points (LP) or more during a month—even the first month you enroll with 4Life. Make sure you and your new distributors reorder 100 personal LP or more the next month. That’s all it takes to receive your Power Pool bonus check and earn entry into the Great Escape drawing! Plus, the more distributors you enroll and the more they order, the more money and entries you earn*—one entry for each new distributor who enrolls at 100 LP or more and two entries for each one who enrolls at 400 LP or more! How Does 4Life Do It? Every month, 4Life sets aside 3% of all the 4Life Life Points (LP) accumulated worldwide for the Power Pool. The remaining 1% is allocated to the Great Escape trip drawing for a five-day all-expenses-paid trip to Cancun, Mexico. Any distributors who qualifies for the Power Pool is automatically entered into the drawing. Enroll more distributors and earn more money* and more chances to win! Start qualifying immediately, there’s no waiting to participate or earn! So enroll now! *Calculation is performed on a pro rata basis using sales volume of the new distributors with at least 100 LP. Volume is limited to 400 LP per distributor. The Premier Pool represents two percent of 4Life’s monthly LP and is established for the benefit of International Diamonds and Gold International Diamonds and Platinum International Diamonds. The Pool is paid out on the 15th of the month following the bonus period. One-half of the amount paid through the Pool is paid on a pro rata basis based on shares earned. Each month a distributor qualifies as an Int. Diamond, one share of the pool will be earned. Each month a distributor qualifies as a Gold International Diamond or Platinum International Diamond, two shares of the pool will be earned. The remaining half of the amount paid through the Premier Pool is paid on a pro rata basis based upon monthly Paid-on Volume from the first six levels of the eligible distributors. Paid-on Volume represents the LP in your organization upon which you receive commissions. The Platinum Pool represents one percent of 4Life's monthly LP and is equally distributed among qualified Platinum International Diamonds each month. For Leaders and above who generate over 100 LP in a month, the first and second generation payout levels are reversed with payout of commissions beginning at the distributor's personal level on his/her Volume over 100 LP. The distributor will receive 25 percent on his/her personal Volume in excess of 100 LP, his/her upline sponsor will receive two percent and the next upline distributor will receive five percent. The payout will continue according to the Life Rewards Plan until all levels of the plan are paid out. A bonus paid to the enroller on a new distributor’s first order. On that first order, the first two levels of the compensation plan are reversed so that the enroller receives 15% to 25% commission. The enroller's immediate upline receives two percent. This happens only on the first LP order. All subsequent volume is paid according to the Life Rewards Plan. ENROLLER - A 4Life Distributor who introduces a new recruit to the opportunity and is credited with obtaining the new recruit's first order. GENERATION - A compressed level on which commissions are paid. GROUP LIFE POINTS (GLP) - Life Points accumulated in the first three levels of a downline (no compression). GLP is used as one qualification for Diamonds and above. LEG - A part of your downline that starts with someone sponsored by you and continues below that sponsorship. LIFE POINTS (LP) - The point value assigned to 4Life product for the purpose of calculating commissions (commissionable volume). ORGANIZATIONAL VOLUME - The Life Points beginning with a distributor and continuing to the bottom of his/her downline. PASS-THROUGH - A bonus paid to a 4Life Distributor for which another in the downline has not qualified to receive. PERSONAL LIFE POINTS - The Life Points generated under a distributor's personal ID#. There is no requirement for a distributor to personally purchase any product under 4Life's Compensation Plan because Personal Life Points include the orders placed under the distributor's personal account by or on behalf of the distributor's retail customers, as well as purchases the distributor makes for his or her personal and family use. QUALIFIED "LIKE" POSITION - A qualified position in the downline with a rank equal to or greater than your own. SPONSOR - A 4Life Distributor to whom a new recruit is placed "frontline". 4Life's Bonus Pools make an industry leading compensation plan even better. Our Life Rewards Plan was specifically developed to empower more people to build their businesses, as well as provide enhanced rewards through the benefit of bonuses that include exciting vacation trips and additional financial compensation. Distributors from every level of our plan are eligible for these remarkable bonuses that offer the opportunity to earn more money and travel in style. 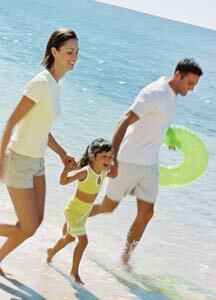 Enjoy some relaxation and easy living on an incredible vacation trip provided by 4Life. As one of the benefits of our incredible bonus pool program. The Great Escape monthly retreat and annual Grand Adventure will take a group of lucky individuals from around the world to a variety of pre-selected paradise destinations. Sparkling beaches, warm waters, majestic mountains, all types of scenic wonders and exciting outdoor adventures - you can be assured that no matter where we take you, The Great Escape and Grand Adventure are sure to offer an incredible range of experiences to match your interests and desires. Begin now - your reward is waiting! 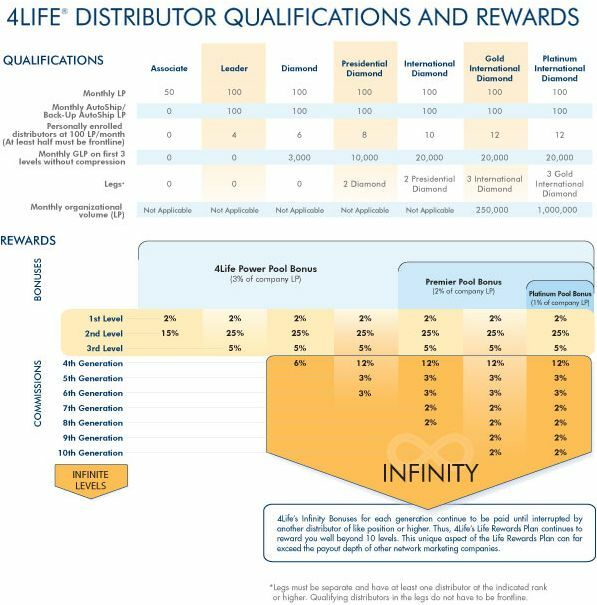 4TH GENERATION INFINITY BONUS - 4LIfe Research guarantees the 4th generation to qualified Diamonds and above. 4Life pays to infinity if there is no "Like" position below the qualified Diamond, or until interrupted by another Diamond or higher. INFINITY PASS-THROUGH - Qualified Presidential Diamonds and above are guaranteed 12% on their 4th generation. 12% commission will continue below the 4th generation until it is interrupted by a Diamond or higher. When the pass through is interrupted by a Diamond, the difference between what the Diamond and Presidential Diamond are entitled to (6%) passes through to the Presidential Diamond. INFINITY BONUSES - For Presidential Diamonds and above, Infinity Bonuses reach deep into your organization and in many instances can provide commissions on all distributor volume in your entire organization. Infinity Bonuses are paid level after level until interrupted by a distributor of "Like" rank or higher. The first two levels of 3% Infinitely Bonuses can only be interrupted by Presidential Diamonds or higher, the next two levels of 2% Infinity Bonuses can only be interrupted by Int. Diamonds or higher and the final two levels of 2% Infinity Bonuses can only be interrupted by Gold International Diamonds or higher. Distributors may enroll Preferred Customers who desire to purchase products only. Preferred Customers are placed on the enrolling distributor's frontline and are not charged an enrollment fee. The enrolling distributor receives 25% (15% for Associates) of Preferred Customer's LP, the next upline receives 2% and the remaining payout continues according to the Life Rewards Plan. Customers do not count towards the qualification of personally enrolled distributors. Purchase 100LP of products monthly and remain on Autoship or Back-up Autoship and get paid as a Leader, permanently! This program is only available to new Distributors at the time of enrollment.